For some peopleÂ one career is enough to keep them busy their entire lives.Â For others, family takes precedence. Then you have those special few people, like author Mary B. Lucas, the ninth out a mind-boggling 10 siblings andÂ a mother of two,Â who somehow manage to do both.Â And not just get by, but to thrive in both areas. Although Mary B. Lucas worked her way up the corporate ladder with a 25-yearÂ careerÂ in a billion dollar staffing corporation andÂ is currently president and principal founder of a major consulting firm, she counts her B.D.Â as her most important accomplishment. That stands for Butcher’s Daughter, for those unfamiliar with current degree programs, and Lucas says she earned it “by listening to my father’s stories about how he achieved success in making deep connections with the people around him.” Â In her new novel, Lunchmeat & Life Lessons: Sharing a Butcher’s Wisdom, Lucas sets out to share the knowledge her father imparted on her with as large an audience as possible. Traversing 25 years of the author’s life, the book is organized into twelve quick chapters, preceded by an informative foreword, and followed by a touching epilogue. Each chapter includes a bite of wisdom summarized intoÂ a few quotes, which are all helpfully listed in the back of the book for quick reference. These tidbits include such gems as “The first hunk of meat you sell is yourself”, “If you don’t like someone then they don’t like you”, and “It’s not the pursuit of happiness, but the happiness of pursuit that inspires.” Each chapter covers a section of the author’s life in which she found herself struggling with a specific issue. Ranging from starting a new job to dealing with difficult clients to addressing negative feelings, Lucas finds herself having a lunchtime discussion with her father in order to resolve the situation. John Bichelmeyer, the quiet, thoughtful butcher, never fails to impress with his motivational suggestions. In the brief 101 pages, Lunchmeat & Life Lessons –Â a title taken from one of Lucas’s nieces commenting on how she helped solve her problems: by going to her grandfather for theÂ titular helpful treats – Lucas manages to impart her father’s unique sensibility: a strong business mind crossed with superbly sympathetic people skills. Throughout the book, the reader can feel both Lucas’s love and respect for her father, as well as her upbeat outlook on life and desire to help share his message with the world. In a moving cross between The 7 Habits of Highly Effective People and Tuesdays With Morrie, Lucas blends a memoir and tribute to her father with effective business management skills and self-help motivation. 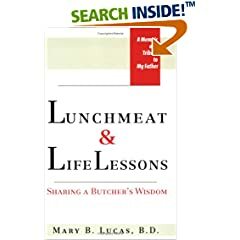 “I’m hoping that business owners and managers will read my book and realize that its wisdom can transform the working relationships they have with their staffs.” This may seem like a tall order for a book full of simpleÂ philosophy from a humble butcher, but with Lucas’s reverant writing style, and her father’s ample wisdom, Lunchmeat & Life Lessons has the ability to do just that. 2 users commented in " Book Review: Lunchmeat & Life Lessons, by Mary B. Lucas "
I loved this book. I happen to know the author and she lives every word of this advice, top to bottom. I encourage all of you to order a copy and simplify your lives by using The Butcher’s Wisdom. My life is better because of it. Thanks for this great review, Zach! The book was a really quick and easy read, full of common sense wisdom, expressed in an unforgettable way. Your only regret on closing the book is the knowledge that you will never get to meet the extraordinary man who dispensed the lunchmeat and life lessons, not because he was a great thinker or because he wanted to be remembered to future generations but simply because he loved his daughter and wanted her to be happy. It’s a great experience and highly recommended!